The Department of Health (DH) today (February 8) endorsed a licensed proprietary Chinese medicine (pCm) manufacturer, Wong Tai Chiu Medicine Fty (Wong Tai Chiu), to voluntarily recall from the market one batch (batch number: 0467) of a pCm, namely [Wong Tai Chiu Medicine Fty] Ser Lee Tan (registration number: HKP-07855), as the total aerobic count of that batch of pCm exceeded the microbial limit set out by the Chinese Medicines Board of the Chinese Medicine Council of Hong Kong (CMCHK). Upon receipt of notification from the Health Bureau of Macao, the DH initiated field investigation immediately and collected samples from Wong Tai Chiu for analysis. Upon testing by the DH's Public Health Laboratory Centre, the result today revealed that the total aerobic count of the aforementioned batch of pCm was found to be 50 000 per gram, which was about 1.7 times the maximum limit set out by the CMCHK. 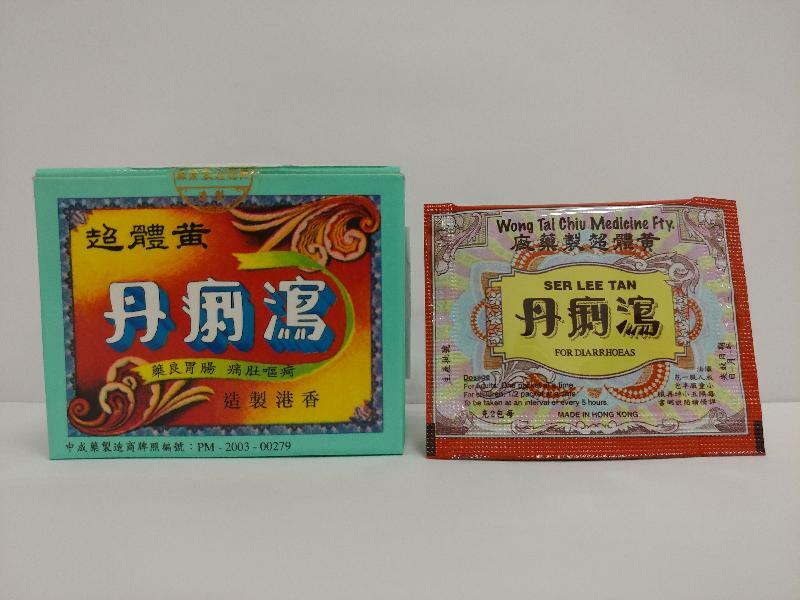 Preliminary investigation showed that the batch of pCm concerned was manufactured by Wong Tai Chiu and is indicated for treating diarrhoea, vomiting and abdominal pain. The batch concerned was entirely exported to Macao and was not distributed in Hong Kong. Wong Tai Chiu has set up a hotline (2395 5439) for public enquiries. "So far, no adverse report related to the use of the pCm has been received by the DH. We will closely monitor the recall. Investigation is ongoing," a spokesman for the DH said. According to section 52 of the Public Health and Municipal Services Ordinance (Cap 132), selling any drug not of the nature, substance or quality demanded by the purchaser is liable to a maximum penalty of $10,000 and three months' imprisonment. Upon completion of investigation, the DH will work with the Department of Justice on prosecution matters and will also refer the case to the CMCHK for possible disciplinary action. The DH urged members of the public who have purchased the above batch of pCm to stop using it immediately. Those who have taken the pCm and feel unwell should seek advice from healthcare professionals. The public can submit the pCm to the Chinese Medicine Division of the DH on 16/F, AIA Kowloon Tower, Landmark East, 100 How Ming Street, Kwun Tong, Kowloon, during office hours for disposal.